[unpad.ac.id, 08/08/2018] Meningitis Tuberculosis (TB) or tuberculosis that attacks the lining of the brain, is more dangerous than tuberculosis that attacks the lungs. Data shows that out of 10 people with TB Meningitis, as many as 5-7 people cannot be saved. According to Prof. Rovina Ruslami, Dr., SpPD, PhD, so far the treatment of TB meningitis refers to the standard of the treatment of pulmonary tuberculosis. This is because, there is no research basis regarding the treatment of TB meningitis globally, so the reference is still following the dose of pulmonary TB treatment. “The nature of the lining of the brain is very difficult for drugs to pass. Only 10% can penetrate the lining of the brain. 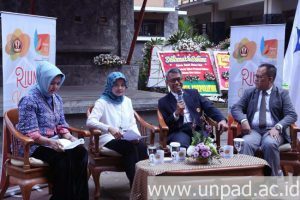 “If it has enough doses in the lungs, it’s obviously not enough for the brain,” said Prof. Rovina who was a speaker in the discussion “Unpad Priority Research and Cooperation for Prosperous Communities (Riung Karsa)” at Bale Rumawat Park Unpad, Dipati Ukur Street No. 35, Bandung, Friday (3/8). Riung Karsa’s discussion this time presented Unpad Rector Prof. Tri Hanggono Achmad, Director of Cooperation and Academic Corporation Prof. Dr. Budi Setiabudiawan, and guided by the moderator of the Vice Rector for Research, Community Engagement, Cooperation and Academic Corporation of Unpad, Dr. Keri Lestari, M.Sc., Apt. For years, Prof. Rovina along with other researchers conducted research on the treatment of TB Meningitis. She focused on the use of rifampicin, the main drug for pulmonary tuberculosis which is considered very strong but more side effect-friendly than other TB drugs. Based on the case of at least drugs that can penetrate the lining of the brain, Prof. Rovina explored the increase in rifampicin doses in TB Meningitis patients. Of course, this exploration was carried out in-depth and careful study, considering the clinical testing process involves humans. “This clinical trial is the highest level of research. “It was rigorously reviewed by the ethics committee and special bodies that monitored it,” explained Prof. Rovina. For almost 8 years Prof. Rovina conducted this clinical trial. Tests were carried out on people with TB Meningitis directly. Giving rifampicin with an increased dose little by little could not be orally or taken to the patient. This is because all TB Meningitis patients are almost certain to be unconscious. “We did it by injection, given by infusion,” She explained. However, this caution was successful. Increasing rifampicin doses gradually decreased the mortality rate from TB meningitis by half. Until now, research conducted by Prof. Rovina managed to increase the dose to three times the dose that had been set. This professor of Pharmacology and Therapy said that an increase in rifampicin dose did not cause significant side effects. The results of her research, the side effects of patients who received high doses of rifampicin turned out to be the same as people who received regular doses. In conducting this research, Prof. Rovina was not alone. Guided by Prof. Tri Hanggono, with Dr. Ahmad Rizal Ganiem, Sp. S (K), Ph.D., team from the Department of Neurology and a research team from Radboud University Medical Nijmegen, the Netherlands. Starting from her postdoctoral program in the Netherlands, Prof. Rovina received a grant from the Dutch Government and continued by Unpad Mainstay Grant for research on TB Meningitis. The results of the study were then able to be published in international journals. Without realizing it, international community responds to her research results. Then, Prof. Rovina received a BOPTN Unpad Research Grant for the second study, as well as a PEER Health Grant from the United States and the Kemenristekdikti PSKLN for the third study. From this third study, three times the increase in rifampicin dose was produced to treat TB Meningitis. The results of this study have again been published in an international journal indexed by Scopus. “But, this is still research. In the world of medicine, everything is very careful. The final exam, carried out by large-scale research, involved many patients from various continents,” She explained. In the near future, the research team collaborating with the international TB Meningitis consortium will conduct research on a larger scale. This study involving five countries, namely Uganda, South Africa, the Netherlands, the United States, and Indonesia, was fully funded by the Medical Research Council or the Medical Research Council (MRC) in the UK. If the results of the larger study were successful and remain safe, methods of treatment of TB Meningitis would be changed. Hopefully, the findings of Prof. Rovina and her team could be proposed as recommendations for the treatment of Tuberculosis Meningitis to the United Nations World Health Organization (WHO). Prof. Rovina said, her research also revealed that TB Meningitis attacks many productive age groups, namely between the ages of 20-30 years. One in three humans on Earth has the potential to have TB germs. “If the environment is influential, TB germs will move/divide. Something what can prevent TB from breeding is the body immune system,” said Prof. Rovina. Although 10% of the Earth’s population has TB germs, these germs will not multiply if the body immune system is good. If the immune system decreased, TB germs will be easy to attack. Maintaining a healthy life is an effective effort to improve the immune system in the body. Smoking, continued Prof. Rovina, has been proven as a risk factor for TB infected. So, do not doubt the smoking ban.